New to Mathews? Here is a peek into what it’s like at our school. Mathews PTA funded Technology Classroom! Mathews School Bus Mural. One of many murals around the school. 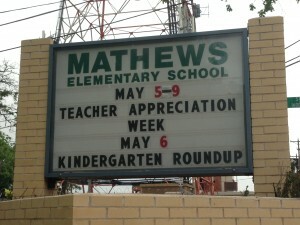 Mathews Elementary from Castleview Productions on Vimeo. Hello Mathews friends, families and students. Here is a look at what’s happening at Mathews in the coming weeks. Teacher Appreciation Week! – May 5th – 9th – Stay tuned for updates on activities from your homeroom parent. Fine Arts Night – Thursday, May 8th! All school art show, 6th grade concert in the gym and Spaghetti Supper in the Cafeteria 5:30 – 6:15 OR 6:45 – 7:30 (two seatings) | $7 per plate includes dessert. Hello Mathews Families! On April 17th, the PTA will hold its last general-membership meeting of the school year. Everyone is welcome to attend, and members of the PTA will vote to approve a budget and a slate of officers for next year. If you’ve ever wanted to know more about the nuts and bolts of parent leadership at Mathews, now’s a good time to find out! Come and ask questions, offer input, cast a vote, and make your voice heard. Your participation is what makes the PTA a powerful community for supporting Mathews children! Get ready for 6th grade Band & Orchestra next year at Mathews! Let us help you choose the right instrument! Come try all of the orchestra instruments during Instrument Selection Night. Please contact Mr. Spencer or Mrs. Smith to set up an appointment if you are unable to attend.